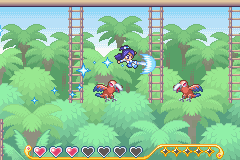 GBA Futari wa Precure Max Heart: Maji? Maji!? Fight de IN Janai (JPN) in 31:49.59 by FractalFusion. An action platform game based on the Precure (Pretty Cure) anime, starring three girls who kick and punch their way to victory. This TAS abuses the physics of this game to speed through the levels quickly. For more information, see the author's comments.